Many books have been written about the Home of Cricket, HQ, The Mecca of Cricket, call it want you want. Lord’s quite simply is the most famous of all cricket grounds. 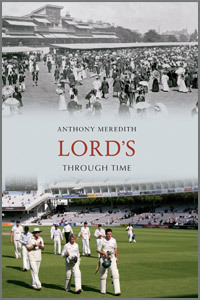 Lord’s Through Time is, however, different as it is more of a personal recollection by Anthony Meredith, an M.C.C member for over forty years and regular contributor to The Cricketer International and a very refreshing addition to the writings of this great ground. Anthony Meredith’s introduction starts with memories of his first visit to Lord’s in 1946 when India were the visitors for England and this brought back memories of my first visit to Lord’s thirty-three years later when I also went to see England take on India. Depending upon your point of view and allegiances, Anthony may have been lucky as India made 200 on that first day in 1946. In 1979, I watched India cobble together 96... From his introduction, I suspect that both of us were mesmerised by the ground, its tradition and history, the austere Pavilion and it is doubtless something that has lived with us and stayed etched in our minds. Lord’s – and the M.C.C- is not only an omnipotent body but it also remains powerful in our minds and a favourite of touring teams. Remember this year when the decision was initially made that the West Indies would not play at Lord’s but at Cardiff? In Lord’s Through Time, Anthony Meredith has produced a wide-ranging series of photographs showing how the ground used to like with alongside how it looks now with a description. Famous faces are shown, photos taken during the Great War, paintings, sketches and, in cases, photographs are included from last season so it is as up-to-date as possible. Comparisons are drawn between his childhood hero, Denis Compton, and his grandson, Nick, who plays for Somerset and the architecture of the still austere Pavilion is analysed as well as photos and drawings depicting the different styles through the various eras. I do not mind admitting that, having been an Associate Member for ten years, I have not seen the featured terracota gargoyle of one of Lord’s famous figures, Lord Harris, on the middle balcony but that is simply because I prefer the Pavilion concourse. I also don’t mind admitting that next time I am up, I will be having a good look at it! There are other features of Lord’s mentioned within this book which I have missed when at the ground but, in my defence, this has been partly due to the crowds during major match days. I am happy to say that I will now, though, make greater effort: there is so much of history and interest at Lord’s and this book will be of great interest to anyone interested in this greatest of cricket grounds. The book is full of interesting stories and anecdotes and has been very well researched. The introduction continues with a history of Lord’s including the author’s interview with another patriarch, Sir George “Gubby” Allen, whose house just outside the ground had its own entrance to HQ, some of the difficulties experienced and dissatisfaction expressed when changes had to be made and he finishes with a look at what the future may hold. For all of us who love Lord’s, we trust that the future is rosy and the recent decision to award two Tests a year to the ground until 2016 suggests that it is. Lovingly presented and with all the photos and illustrations featuring the old and the new, I am sure that Lord’s Through Time will appeal to all cricket lovers.